They tend to be small, certainly smaller than Barcelona's alpha beast symbol, the dragon, but if you look closely, you'll see them tucked in the oddest places. Why bats? In spite of their current Halloween and vampire reputation, in many civilizations the little 'Guardians of the Night' are symbol of rebirth, emerging out of their womb-like caves every evening. Or you could see them as mini-dragons. Barcelona's bats, however, may well have another meaning. 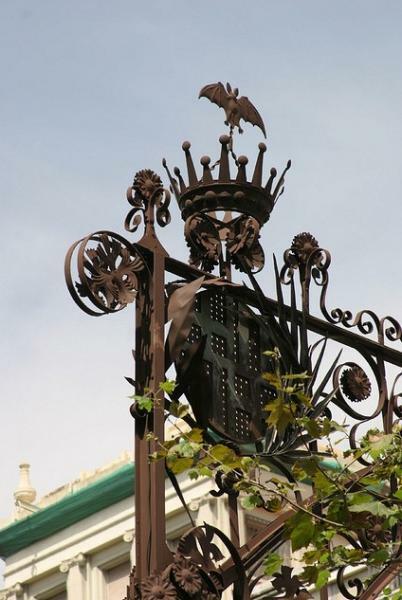 When the city's Count-King Jaume the Conqueror took Mallorca from the Moors in 1229, he made Palma’s symbol the bat. Jaume had been educated by the Knights Templar, and whether or not Jaume was fluent in Arabic is unknown, but his allies and counsellors were: the word ‘bat’ in Arabic has the same root as the word associated with ruins and ‘to overthrow’. But the bat was not a mere message of a fait accompli to Jaume's new Moorish subjects. The word has a second meaning in Arabic as well – ‘seeing well only at night’. Idries Shah, the great writer on Sufis, once explained: Like the bat, the Sufi is asleep to ‘things of the day’ – the familiar struggle for existence which the ordinary man finds all-important – and vigilant while others are asleep. In other words, he keeps awake the spiritual attention dormant in others. That ‘mankind sleeps in a nightmare of unfulfilment’ is a commonplace of Sufi literature. The bat was also the trademark of a Catalan wine exporter to Cuba named Facundo Bacardi Masós, who began to distil rum in 1862. Despite the symbol's venerable heritage, the Bacardi company claims that their bat was merely a visitor who haunted the rafters of their first distillery.